All photographs entered must have been taken at Phinizy Swamp Nature Park. All entries must be received by Phinizy Center by no later than May 1st at 5 PM. 1858 Lock and Dam Road. Entries will be juried by a panel of at least two professional photographers. Works will be judged on creativity and originality as well as skill level. Finalists will be notified by May 15th. The top 10 photos in each category must be printed and framed in Gallery Style (black frame with a white mat) and must have a wire hanging system. The print size must be between 8” x 10” and 16” x 20”. Maximum frame size is 20”x24”. Finalist photos will be shown at the annual Swamp Soiree and in our Visitor Center. These must be delivered to Phinizy Swamp Nature Park no later than June 5th at 3:00 PM. Includes any work that features a scenic location at Phinizy Swamp Nature Park, including man-made structures, flora and general scenery. 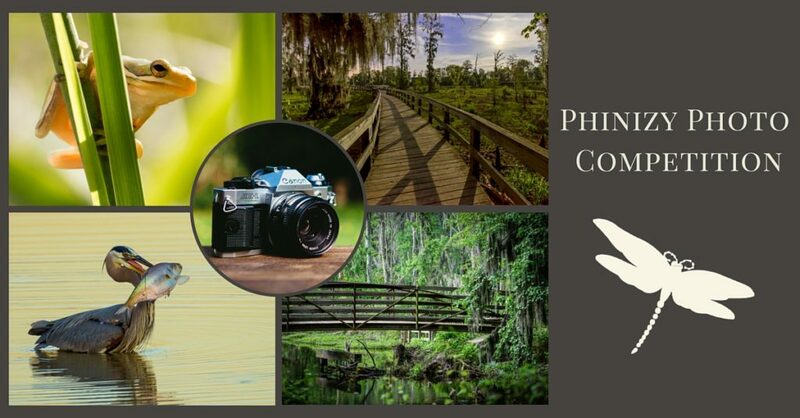 Includes any work photographed at Phinizy Swamp Nature Park that features our abundant wildlife, including birds, reptiles, mammals, insects and other wildlife. Includes any work photographed at Phinizy Swamp Nature Park that features a person or persons, either active or passive, in the park. People must be aware that they are being photographed and give you written permission to have their image entered in to a photograph competition. This will be voted on by the public via Facebook.